Gi Joe A Real American Hero #188 just arrived SPOILERS- BLOOD FOR THE BARON!!! So i woke up this morning to see a large envelope with my lastest issue of Gi Joe ARAH #188 on the floor at the front door. Hooray. Black Major, Red Shadows and Muton. I havent actually read the story properly yet, but its only part 1 so far, it continues in #189. Maybe some of you other guys who pre order a copy have it too. I put spoilers in the title, just in cause folks dont want to know which characters are in the issue. Finally got it! Great issue! (Poor Dr. Burkhart -- she's been around forever!) Love the upgraded Muton and the Shads have visors now instead of little white "Batman" eye slits. Cool! got them and they are v cool. 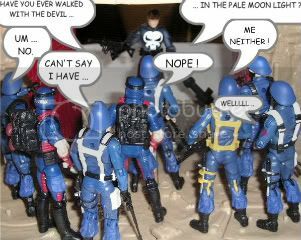 my only complaint was that they didnt get to kill a bunch of joes. BAF got me used to them killing at least a few unnamed good guys.. I got the volume 7 trade today it was pretty good I hope we do see more Red Shadows but it seems Larry has already got his plots up to #200 already mapped out.